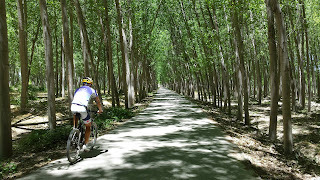 Biking the valley around the city of Granada in southern Spain is so flat it is almost incongruous to the mountains that rise from it, the Sierra Nevada, Spain´s highest on the mainland. 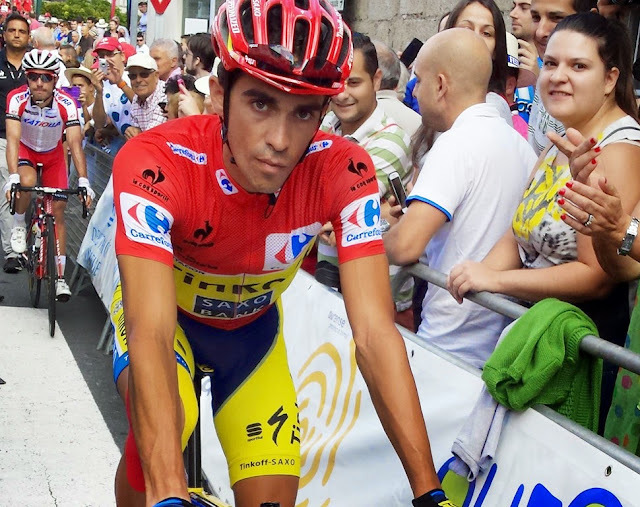 Starting by following the Rio Genil, out of the former royal city of Granada, it is a great area to explore on 2 wheels and surprisingly holds a bounty of legends and tales of some famous personalities. The lush farmland around, irrigated by former Moorish water channels was at one point allocated in 1813 to the Duke of Wellington for his services for the War of Independence. Nowadays, keep a lookout for the wooden slatted shacks along the route near Santa Fe. These attest to the first crops of tobacco, carried from the New World by Christopher Columbus as a souvenir. These buildings are still used today to dry the tobacco leaf for use in the manufacture of cigarettes. As well, alongside the road, the great cactus (prickly pear) with its ruddy palm sized fruits, which they eat and call chumbera here, has its roots, figuratively speaking from those countries Columbus journeyed to. Looking like something out of a Western B movie from a Hollywood set the harvest season for the ‘higo chumbo’ fruit sees local markets selling prickly baskets of the spiky desserts with locals wearing tough gardening gloves to peel them exposing the soft sweet pulp underneath. These are your first hints of being touched by the exotic. 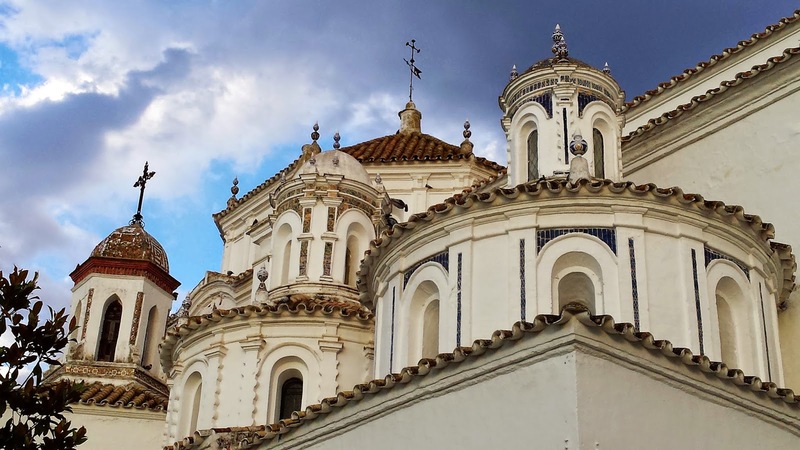 You would never think that this placid farmland and the small whitewashed villages, now commuter towns for Granada, harboured anything but the ordinary. The River Genil, born on the northern slope, is fed by the ice and snow of the peaks, the highest being Mulhacén at 3,478m and flows through 4 provinces along its 358km length. It is in a small town outside Cordoba, Palma del Rio (a place where Columbus stayed prior leaving to explore) where it flows into the Guadalquiver (“Great River” in Arabic and even earlier, “Betis” to the Phoenicians, hence sprung the name for this main province in the Roman Empire, “Hispania Baetica”). This the same river used by Columbus and Magellan on their passage to the Atlantic. Great Cycling Food - Fresh Almonds! Continuing on eastward towards the Sierra Nevadas, Santa Fe lies a close 11k to Granada and the route stays level all the way. The town’s name means “Holy Faith” and it has a turbulent history arising from when defeating the Moors was of foremost importance to the Christian rulers in the 15th century. 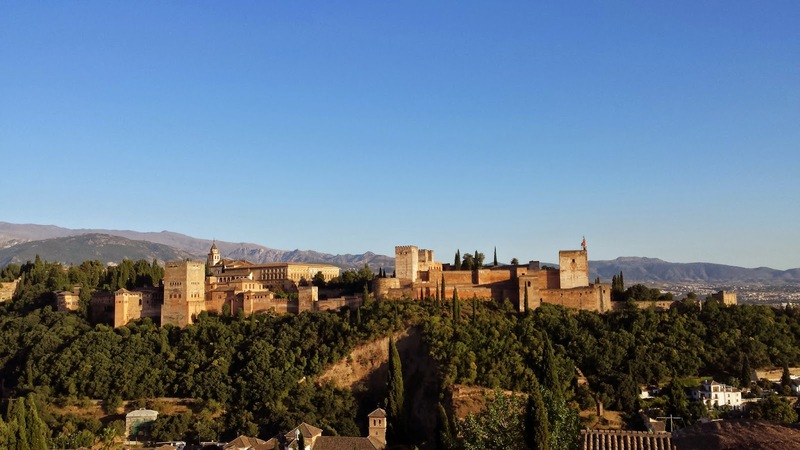 Thus on April 1491, Santa Fe became the seat of power for Isabella and Ferdinand until they took possession of the Alhambra in Granada later in 1492 and raised their royal standard atop the Alhambra’s Torre de Vela. This relatively small agricultural town that most drivers bypass on the highway is of enormous significance and with the hum of traffic in the distance you can see the Casa Real (Royal House) where the treaty between the Arab ruler and the Christian royalty was signed, changing the whole face of Spanish, and Andalusian history in particular, forever. Just as exciting, Isabella’s conversations with Columbus prior to his explorations took place here. The story goes, that after kicking his heels for 6 years waiting on the King and Queen to put the state into order, he was finally given a Royal summons to appear here…...and then given the brush off. Pretty down at heart, he got on his mule and started north with the idea to approach the King of France when suddenly Isabella changed her mind and sent a messenger to catch him (he had gone less then 10km) and bring him back. Thus it was that in August 3rd, 1492, after King Ferdinand and Queen Isabella, the rulers of the Spanish kingdoms of Castile and Aragon, agreed to outfit 3 ships with 90 crew, Columbus set sail. Sailing from the Guadalquiver, of which the Rio Genil flows out to the ocean, or the so call, “Sea of Darkness”. 70 days later they saw land and set down on October 12th, on the island of the Bahamas and called the welcoming natives, “Indians” thinking that they were in the East Indies. Traces of this historic event are pretty much consigned to a somewhat odd sculpture just off the main square and the large church in the centre. The church dominates this square and is a neoclassical 18th century creation (1785). See the motif of Columbus, Isabella and Ferdinand, with the Nina, the Pinta and the Santa Maria on the outside. It has an attractive cupola and interior, which can be refreshingly cool to explore on a hot day. Next door is the most excellent and newly refurbished town centre which hosts some art exhibits from the famous international community with emphasis on the “Indias”. Santa Fe is also the place Isabella and Ferdinand waved their daughter, Catherine (Catherine of Aragon) off, as she journeyed to England in order to marry Henry 8th's brother, Arthur and then later, Henry himself. And so began a tumultuous chapter in Europe´s history when he later tried to divorce her and marry Anne Boleyn. Catherine always considered the Alhambra her home and had beloved childhood memories of growing up there. Their daughter, Queen Mary Tudor I, “Bloody Mary”, never visited. Today it is a somewhat quiet town, a gateway and commuter place for those working in Granada and surrounded by flat vegetable fields with a pleasant centre that still corresponds to the 1491 town plan. Four large brick whitewashed gates guard the entrance to the town’s centre. 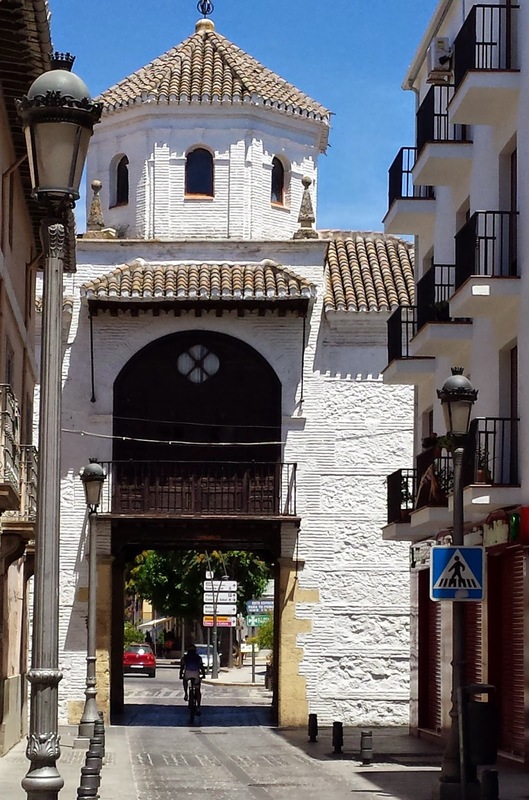 Three re-built in the 18th century except for the Loja gate, an original constructed in 1652. The Plaza de España is an attractive square often the scene of children’s fun fairs or festivities, is lined with several good pastelerias selling cakes, coffees and helado (ice creams). The town’s favourite treat is a probably Arab derived sweet (due to its Arabic favoured ingredients) called a Piononos, a soft honey soaked cake with custard and cinnamon spice sprinkled over it. It is credited to confectionar, Ceferino Isla Gonzalez, who made it in the 19th century, as a homage to Italian Pope Piux IX (in Italian, Piu NoNo). A sculpture of him stands 100 meters from the main square. Finally the Sierra Nevada, which has been your constant companions for the afternoon, is at your doorstep again as you arrive in Royal Granada. The Rio Genil, which we’ve been following throughout the day, has lead us back into city centre. Explore this area on our Cycling Day Trip from Granada.